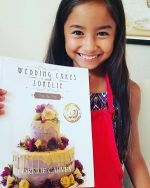 Have you always wanted to try fondant cake decorating but it was a little scary or you weren't sure where to begin? 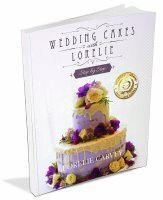 Embellishing a wedding cake with fondant might seem intimidating at first, but if you read along and give it a try you will see that with a little patience and practice it is really not so difficult. 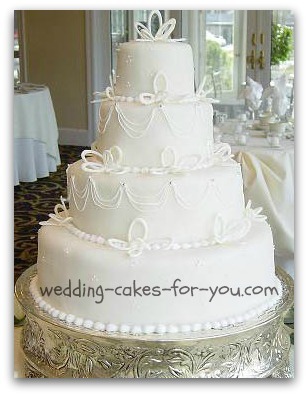 There are loads of fondant cake decorating ideas on this website for you. Including snowflakes, drapes, ribbons and gumpaste flowers. 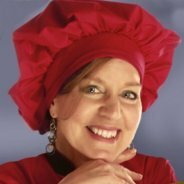 Browse this page for style concepts, inspiration and tutorials. "By the way your tips that I read on your website about the buttercream and not adding milk was fantastic. I used it under the last fondant cake I made. It held in place beautifully even though the cake was moved around quite a bit. There was no bulge and nothing ran out from under fondant etc..."
Links and more information about the cakes shown above. If this is your first time here please see the main fondant directory page with photo links to all of the fondant pages on this website. Browse them all so you won't miss a thing. 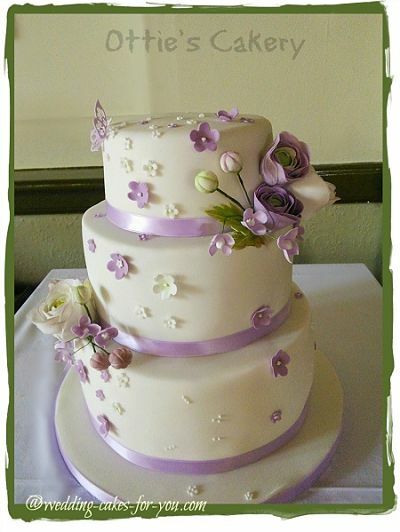 A fondant beauty by Ottie's Cakery. Featuring Ranuncula gumpaste flowers. 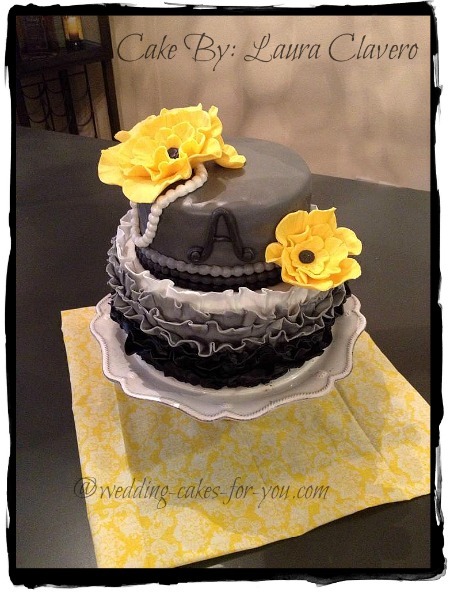 Ez Topperz combines buttercream Swiss dots, ribbons and gumpaste flowers to make this super sweet cake design. Find Ez-Topperz on Facebook. 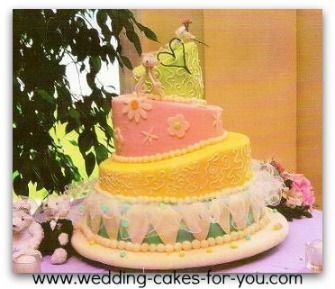 The Dr. Seuss cake (shown at the top right of this page) is also known as a topsy turvy and is a fun whimsical design. The challenge with these odd shaped cakes is wrapping the fondant without creasing or tearing. The solution is to take your time and make sure your sugarpaste is very pliable without being too dry or too moist. This comes with practice. Simpler Version: Try this with a regular stacked cake before attempting a crooked cake. 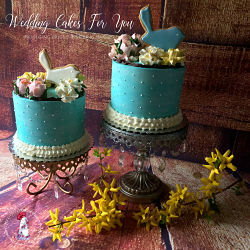 It will still have a whimsy look if you use with bright colors, big bows and fantasy type gumpaste flowers. 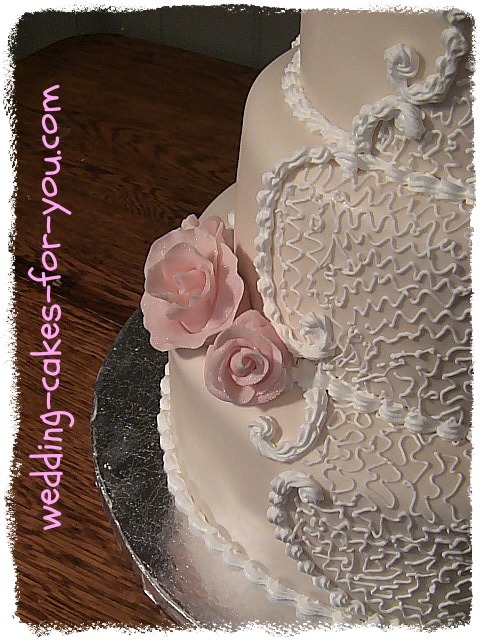 If it's your first time using fondant this is a great choice of decorating designs. The reason is that most the tiers are covered in Cornelli lace. With loads of fresh roses and greenery, you can cover up any mishaps, such as small cracks or creases. If you practice en-robing you won't have to cover up so much. I am here to tell you that there is always a better side to your magnificent creation. So please don't shy away from giving this versatile rolled icing a try. This is one of my earlier designs and the photo quality is not great, but I included it because it shows how you can decorate fairly simply by using of fresh flowers. 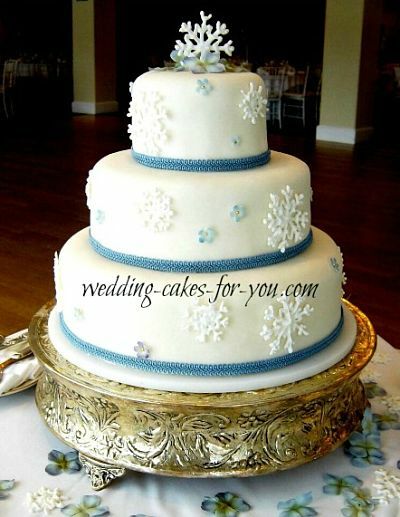 The snowflake design is the ultimate for a winter wedding. Again it is simply covered with fondant. Blue ribbon was used as a border and little blue flowers were made ahead out of sugar paste and then painted with petal dust. 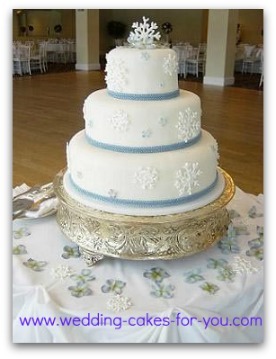 The snowflakes are made with royal icing and then dried overnight. They are very delicate so you will need to make extra just in case. I've done several of these snowflake pieces, this one is my favorite because of the little touches of blue. By using ribbon for borders and little cut out flowers, you can simplify the process. Anything goes! Whatever your hearts desire it can be used in today's designs. The bride made her own topper, out of pipe cleaners. 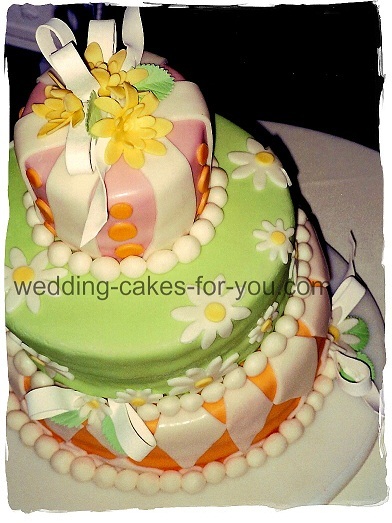 Pink, yellow, blue and green colored fondant make up each tier. 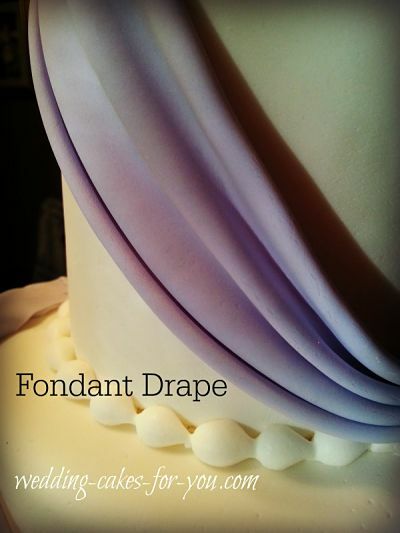 The ruffle is tulle edged with royal icing and the border is made with balls of sugarpaste. Daisies are cut with special cutters. 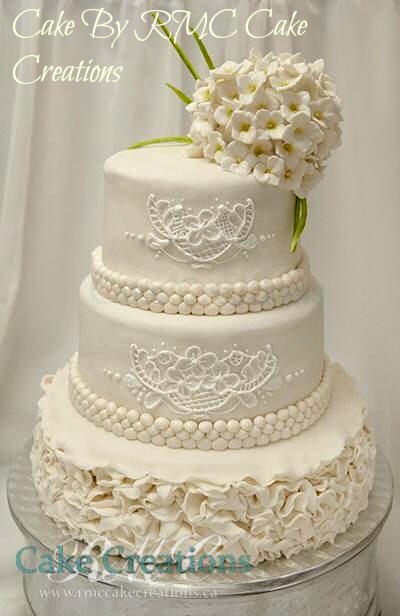 Cornelli lace is piped using royal icing. The fondant cake decorating technique which combines sugar paste and piped royal icing is not as difficult as it looks and has a lovely effect. 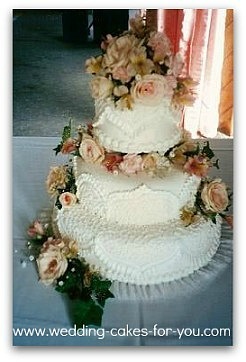 The royal icing decorations cake is pictured above. 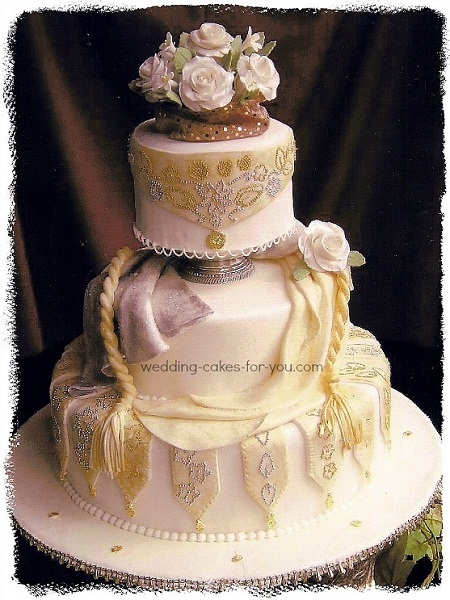 The ribbons are made ahead and dried, then placed on the cake with a dab of royal icing. 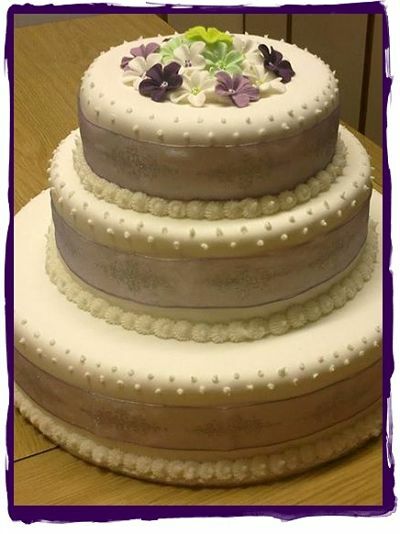 Little silver dragees are a part of the design and echo the dotted Swiss composition on the bottom tier. (difficult to see in this old vintage photo of mine. 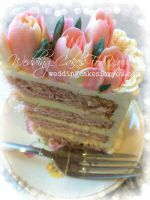 I have come across an Australian website, where the owner has devoted a section to the art of Cake Decorating – the way it is commonly done in Australia. 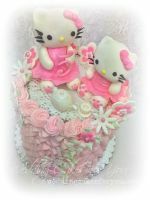 Buttercream is not popular in Australia due to the humidity and heat, but most professional cake decorators there are very comfortable working with fondant. They also mold their life-like flowers from a Mexican paste or Gum Paste (recipes included on her site).